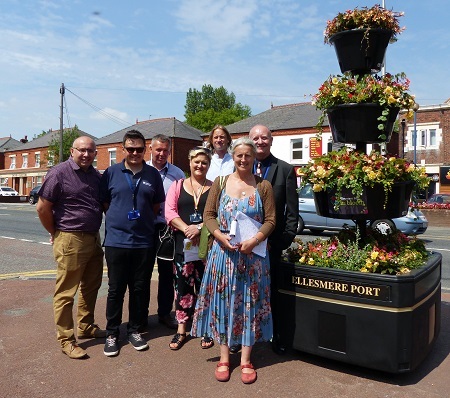 For the very first time Ellesmere Port has entered into the ‘It’s Your Neighbourhood’ category of the North West in Bloom competition. The non-competitive category is the town’s first steps towards a full entry into the prestigious horticultural competition. The Council’s Cabinet Member for Environment, Councillor Karen Shore said: “The ‘It’s Your Neighbourhood’ category is all about bringing members of the community together to make a positive change to the place they live, work or spend their leisure time. “Many groups are doing marvellous work all over the town and I’m delighted the entry in North West In Bloom brings them all together to showcase what wonderful results are being achieved. “We have planted 20,000 bulbs throughout Ellesmere Port this year, wildflower planting on open spaces and verges, as well as the wonderful flowers in the town centre planted by our StreetCare Services teams. Groups participating in the campaign are asked to focus on its three key themes of: Community Participation, Environmental Responsibility and Gardening Achievement. While participating groups are not judged against each other, they are visited by environmental and horticultural “in Bloom” experts, who provide valuable feedback and helpful advice on how to develop current activities and encourage ongoing improvements. North West in Bloom judge, Julie Livesey visited the town earlier this month to assess the work completed so far. A formal grading on the standard of the entry will be made in October this year. North West in Bloom judge Julie Livesey; Cabinet Member for Environment, Councillor Karen Shore, ward member Cllr Mike Edwardson and officers from Cheshire West and Chester Council during the judging.